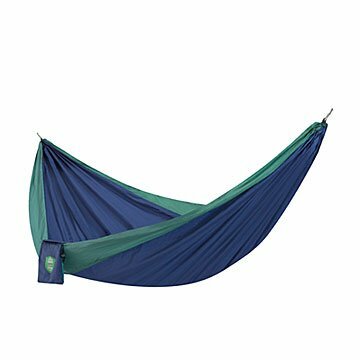 This lightweight, packable hammock is great for wherever your travels might take you. This lightweight, easy-to-pack hammock is great for wherever your travels might take you. But it's also packed with a purpose: Production helps support sustainable employment for rural Thai women and a path out of poverty for their families. Made of parachute nylon taffeta, its ultra-light design is matched only by its super strength (holds up to 350 pounds). It's also breathable, fast-drying, and machine washable, so your hang-out is comfortable and low maintenance. It includes two weatherproof polyester ropes and Smart Hooks for easy hanging and rolls into its small pouch that fits easily into your suitcase or backpack. Even the pouch doubles as a holder for a water bottle or a good book when the hammock is in use. Handmade in Thailand by Yellow Leaf Hammocks, one of our fellow B Corporations. Hand wash for light dirt or stains. Machine washable on gentle/cold cycle. Remove s-hooks prior to washing. Only use mild detergent. Hang dry.